The hair dryer holder provides the extra convenience. The hair dryer holder holds your hair dryer and comb together, freeing up an extra hand. Barbe's Perfect helper, the real release of your hands. You deserve to have it. 1. Made of galvanized stainless steel material, which is durable and waterproof. 2. This type of hair dryer holder is set up without suction cup, which does not require the facade to be smooth and seamless. It stabilized on the wall by nails, which is 100% stable. 3. Barbe's Perfect helper, the real release of your hands. 4. Exquisite and delicate, good helper for the home storage. 5. 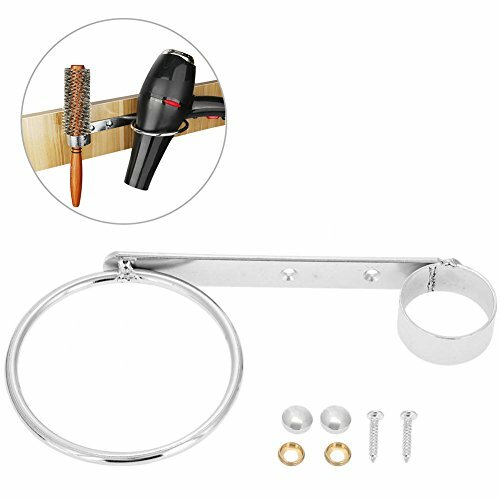 Two rings in size, which is easy for storage of the comb and hair dryer. HIGH QUALITY - Made of galvanized stainless steel material that is durable and waterproof. Exquisite workmanship, aftertreatment, stamping and forming with silver-colored coating. FEATURES - This type of hair dryer holder is set up without a suction cup, which means the facade does not have to be smooth and seamless. It stabilized on the wall with nails that are 100% stable. Ideal for all types of places like bedrooms or bathrooms. Just save your life and save your time.